Q. Does the Wind Energizer damage the turbine in high winds? The amount of speed increase is really rather small, usually at most a few meters per second. The Wind Energizer makes the wind more uniform, therefore LESS likely to cause damage. Modern turbines are built so that they avoid damage at high wind speeds, for example, by feathering the blades. The Velocity Vector Chart (right) below shows that the vectors of the altered wind return mostly to the horizontal by the time they reach the blades. Q. What are the key benefits of this groundbreaking technology? The Wind Energizer can direct the shear layer below the height of the blades. The shear layer does not increase TKE (turbulent kinetic energy) in the area of the blades. 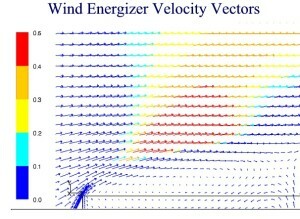 The Wind Energizer is successful in equilibrating wind velocity and creating uniform flow in the area of the rotor. 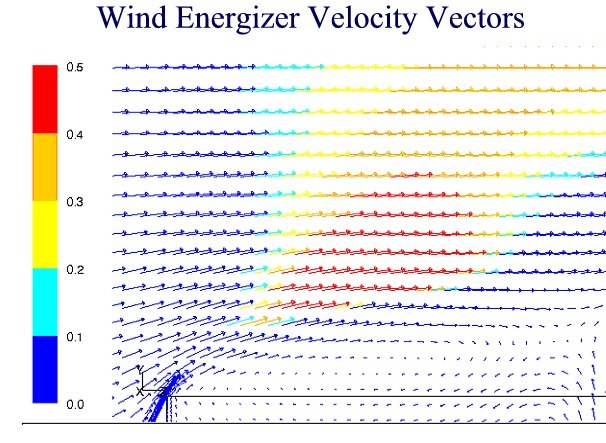 The Wind Energizer does not create a significant change in flow angle. The TKE is similar at different wind speeds. The wake of the Wind Energizer dissipates downstream. The Wind Energizer’s production of increased power is fully compatible and coincident with its other function of reducing stresses on the gearbox of the turbine. Q. Is it necessary to build a 360-degree structure, which is obviously more expensive? We addressed this question by making a partial structure primarily in the direction of the wind. We have shown that the flow in the rotor plane is not adversely affected in any of the cases, while in the design case of wind coming from the front, there is a significant favorable velocity increase. Q. Does each wind turbine require its own Wind Energizer, and how much does it cost? Each wind turbine DOES require its own Wind Energizer which costs approximately $500,000. Purchasers will realize a 25% return on investment per year. Q. Can the Wind Energizer be used on any wind turbine? Yes it can, even as a retrofit.